After Assault Allegations, Classical Institutions Rush To Distance From James Levine : The Record The conductor, trailed by "scurrilous rumors" for years, has now been publicly accused by four former proteges of sexual assault when they were either teenagers or young adults. 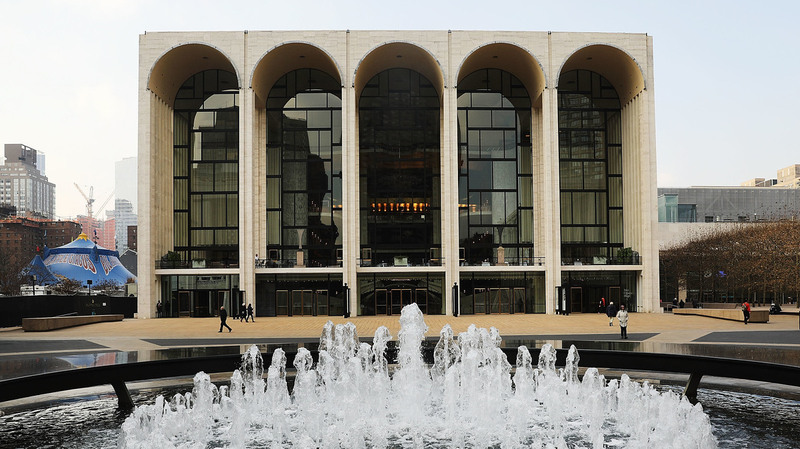 New York's Metropolitan Opera House in Manhattan. Famed conductor James Levine, its music director emeritus and former conductor, was suspended by the company while allegations of sexual misconduct are investigated. Updated, Dec. 8, 8:20 a.m. ET with a subsequent statement from James Levine and James Lestock. New allegations of sexual assault have been made against James Levine, the music director emeritus of the Metropolitan Opera in New York and its conductor for over forty years. Levine was suspended from his position over the weekend, and now, with more allegations made public, repercussions for the lauded musician are continuing to pile up. The first public allegation was made when a police report filed in 2016 was provided anonymously to the New York Post and The New York Times. That accuser was later revealed to be the violinist and pianist Ashok Pai. Three others have emerged publicly: bassist and professor Chris Brown, who now lives in Minnesota; James Lestock, a cellist in North Carolina; and violinist Albin Ifsich, a longtime member of the New Jersey Symphony Orchestra. Ifsich told the Times he was a 20-year-old student at Michigan's Meadow Brook School of Music when Levine, then a teacher at the summer program, allegedly began abusing him. Pai, Lestock and Brown were all teenagers when the alleged abuse was said to have occurred. Levine's management did not return multiple requests for comment, but gave a statement to The New York Times on the evening of Dec. 7, denying the allegations. "As understandably troubling as the accusations noted in recent press accounts are, they are unfounded," Levine wrote to the Times. "As anyone who truly knows me will attest, I have not lived my life as an oppressor or an aggressor." In a follow-up, Lestock said of the response: "He's lying." Pai's alleged abuse began when he was 15, while attending the Ravinia Music Festival in Illinois, a prominent summer program that trains aspiring professional musicians, and which Levine led as its music director from 1971 to 1993. A spokesperson for the State's Attorney, where Pai filed his police report, told the Post that charges have not been brought against Levine but that the case is still under review. In Pai's case, the statute of limitations for sexual assault of a minor in that state has since expired. Rumors of Levine's conduct have swirled around the conductor for years, including an anonymous letter sent to the Met's executive director in 1979 pointed out by the Times. The letter prompted a response from the Met's executive director at the time, Anthony A. Bliss: "Scurrilous rumors have been circulating for some months and have often been accompanied by other charges which we know for a fact are untrue." There had been no known public accusers until Ashok Pai came forward. The Metropolitan Opera announced on Sunday that it had suspended its relationship with Levine and removed him as conductor of several upcoming performances. The Juilliard School — Levine's alma mater — has also replaced him in a scheduled February performance with the Juilliard Orchestra and singers from the Met's Lindemann Young Artist Development Program. The Met's general manager, Peter Gelb, told the Times that his company learned of Pai's allegations last year, when Illinois police contacted the administration, but told the Times it had been waiting for the police to take action before going ahead with its own. After those initial reports were published, the Met's press office released a statement saying that it was starting its own investigation. He also told the Times that the Met's upper administration knew of complaints about Levine going back to 1979. "While we await the results of the investigation, based on these new news reports, the Met has made the decision to act now. This is a tragedy for anyone whose life has been affected," Gelb wrote. Several powerful male figures in high-profile roles have faced repercussions over accusations of sexual harassment and assault in recent months — including two senior members of NPR's news staff — reflecting a cultural shift in how these cases are received and dealt with. Levine, a towering figure in the classical music world, was appointed to multiple high-level roles at leading orchestras and organizations, including many events like Ravinia, throughout his decades-long career. The Citizen-Penguin, student newspaper of the Juilliard School, published a letter on Monday written by its student council requesting Levine be replaced as conductor for that upcoming concert and that the school issue a statement on the situation. "We look forward to the day when sexual abuse by leaders in our fields is unthinkable, but we know it is still all too common. In this case, we believe a swift and meaningful response is a necessary step toward that vision." Juilliard's president, Joseph W. Polisi, and the school's dean, Ara Guzelimian, did so the same day. "In light of recent reports, Mr. Levine will no longer be conducting the concert. We are now actively searching for a conductor to take over the concert. The Juilliard School is committed to providing a safe and supportive environment for all members of the community," their joint letter read, in part. The Ravinia Festival in Illinois, which is also the summer home of the Chicago Symphony Orchestra, ended its relationship with the conductor in the wake of Pai's allegations. In a statement provided to NPR, the festival says it has "severed all ties" with the conductor, who "was to begin a five-year term as conductor laureate in the summer of 2018. Ravinia maintains a zero-tolerance policy and culture on sexual harassment. We are deeply troubled and saddened by the allegations and sympathize with everyone who has been hurt." The Boston Symphony Orchestra, where Levine was music director from 2004-11, issued a statement on Sunday, writing that it had "adhered to a due diligence process" before hiring Levine and that it "was never approached by anyone in connection with with inappropriate behavior by Mr. Levine." Reached for clarification, a spokesperson for the Orchestra said that the statement also applies to Tanglewood Music Festival, the summer home of the BSO and also one of the world's best-known training programs for music students. Levine was a regular presence at the Tanglewood Festival. In a follow-up statement, the Orchestra told the Boston Globe that Levine "will never be employed or contracted by the BSO at any time in the future." A scheduled concert of the Cincinnati Symphony Orchestra, to be led by Levine at the May Festival next spring, was also canceled on Sunday. "A replacement conductor will be announced at a future date, a spokesman for the festival and the Cincinnati Symphony Orchestra told the Cincinnati Enquirer yesterday. Levine, a Cincinnati native, led the festival in the mid-1970s. A request for further comment from the May Festival's executive director, Steven R. Sunderman, was not immediately returned. In a statement to the Cleveland The Plain Dealer Monday, the Cleveland Orchestra, where Levine was an apprentice and assistant conductor in the '60s, said, "We are not aware of any complaints made during his time with the orchestra," Levine last worked with the orchestra in 1970. The American Federation of Musicians' Local 802, the union which represents both the orchestral musicians of the Metropolitan Opera, also issued a statement on Monday that read, in part: "We are horrified and sickened by the recently reported allegations of sexual abuse by Mr. Levine. The Metropolitan Opera has an obligation to all employees to provide a safe workplace free of sexual harassment and discrimination." The American Guild of Musical Artists, which represents the Opera's choral members, released a statement of its own addressing the allegations, writing that "The Met has a legal duty to provide a safe workplace and take all reasonable steps to prevent harassment. This duty includes conducting prompt and diligent investigations in response to credible complaints of misconduct with appropriate actions where warranted. This is especially important when the alleged abuser is in a position of power and authority." In a second statement issued today that added to its original, the Boston Symphony Orchestra writes that it "and the classical music industry must seriously reflect on this moment and determine ways to ensure sexual misconduct has no place in our industry." This article originally identified the American Federation of Musicians Local 802 as being the union representative of the choral members of the Metropolitan Opera — they are represented by the American Guild of Musical Artists.